The September issue (issue 244) will be the last edition of Special Children magazine. With readers' priorities changing, we'll be focusing our resources on our digital SEND services, such as the Knowledge Centre and the SEND Inclusion Award (SENDIA). We’re very proud of the high-quality content which the magazine has generated through the years, and are extremely grateful to our editors for their passion and dedication in championing your needs. If you are an existing Special Children subscriber, we would like to thank you for your time and dedication to the magazine. Of course, you will be refunded for whatever remains of your paid subscription period. Our finance team will be in touch in due course with details. If you have any queries in the meantime, please do not hesitate to contact our subscription team on 0845 450 6404. Download your free copy of our SEND year planner to ensure you stay on top of your priorities and meet all statutory requirements for the academic year. Demonstrate to stakeholders that your school has achieved an outstanding level of SEND provision with our SEND Inclusion Award. For more resources to support professionals in meeting children's additional needs, check out the wide range of products available at the Prospects Education Resources website. 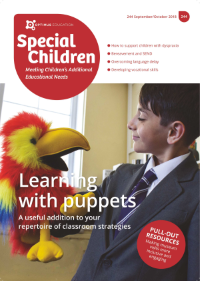 Optimus members still have access to digital PDF copies of past editions of Special Children magazine, articles and resources published online, as well as full access to the Optimus Knowledge Centre. To access Special Children online, take out a free trial of the Knowledge Centre.